Dark matter is the most common matter in the Universe, accounting for nearly 85% of the total mass of the cosmos. But while we know dark matter is out there, we have no real idea what it is. Lots of ideas have been proposed, such as WIMPs or exotic particles known as axions, but another idea is that it might be caused by black holes. Not ones that formed from dying stars or the giants in the hearts of galaxies, but primordial black holes that formed soon after the big bang. Most models of primordial black holes propose that they formed during the first few milliseconds of the Universe. Depending on the model their hypothetical sizes range from tiny ones the mass of a small mountain, to large ones dozens of times more massive than the Sun. There has been a great deal of effort to observe primordial black holes, but so far there has been no signs of them. For this reason, primordial black holes have not been a popular solution to the dark matter problem. There would have to be lots of primordial black holes out there to account for dark matter, and their presence would be seen by things like the gravitational lensing of starlight. The recent detection of gravitational waves, however, has rekindled interest in dark matter black holes. The LIGO observation saw the merger of two black holes roughly 30 solar masses in size. This is curious, because we’d expect stellar collapse black holes to have less mass than that, and intermediate mass black holes found in star clusters typically have more mass than that. It’s hard to imagine how the LIGO black holes could have formed from either stars or mergers, but they do fall within the upper range of primordial black hole models. They also fall within the mass range that’s hardest to rule out as a dark matter candidate. A recent paper in the Astrophysical Journal Letters argues that black holes like the ones seen by LIGO could account for dark matter. To support this idea, Alexander Kashlinsky looked at fluctuations in the cosmic infrared background. Unlike the cosmic microwave background, which is the thermal remnant of the big bang, the cosmic infrared background is caused by a wide range of processes that produce infrared light, such as heated gas within galaxies. 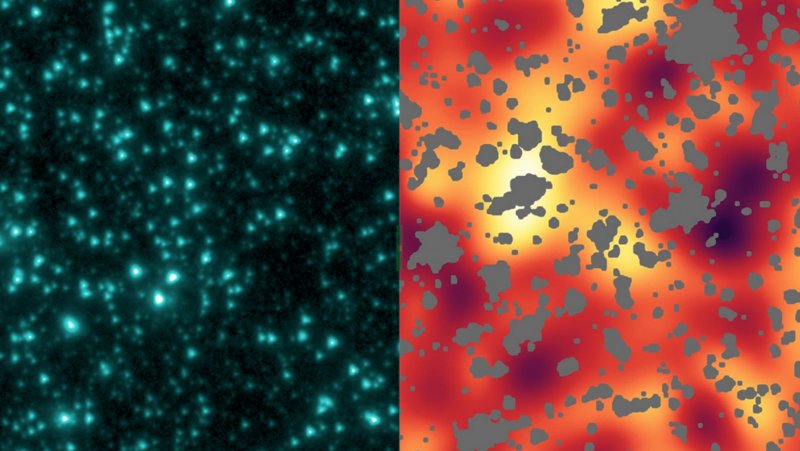 Fluctuations in this background can tell us about the structure of its sources. Kashlinsky compared infrared fluctuations with the distribution of known sources such as galaxies, and found some of the fluctuations couldn’t be accounted for by known sources. The scale of these fluctuations agrees with a dark matter distribution of LIGO-mass black holes. So it’s possible that black holes could explain dark matter after all. There are reasons to be cautious however. In addition to black holes, there are other models that could explain the fluctuations of the infrared background. There’s also the fact that while LIGO has found black holes on the order of 30 solar masses, we don’t know if such black holes are common or rare. However further observations of the infrared background and the gravitational waves from black hole mergers can answer these questions. If LIGO-mass black holes turn out to be quite common, then the great mystery of dark matter could be solved by primordial black holes after all. I would think there are many ways to test this idea, beyond what’s in the cited Kashlinsky paper. For example, how consistent is the distribution of PBHs (per Kashlinsky) with the many MACHO searches (e.g. OGLE)? As Kashlinsky notes, PBHs would interact with their environments; in the inter-cluster and inter-galactic medium (IGM), how would that interaction affect the relative abundances of the primordial isotopes? Interactions between PBHs and IGM in the jets and lobes of extended radio sources would also likely leave observable footprints, in both the x-ray and IR; sorta a local version of what Kashlinsky says produced a component of the CIB, at very high redshift. I wonder if any of the peer reviewers asked Kashlinsky about these tests (the document is “in press”, so apparently has already undergone peer review, and found to be OK)? Wouldn’t Primordial Black Holes at the low end of the proposed mass range have evaporated by now? I know a stellar mass singularity can last until now and well beyond, and supermassive ones will be around to watch the heat death of the rest of the universe. But wouldn’t one with the mass of a mountain have ceased to exist after ~13.8 billion years due to Hawking radiation? (Which is why, even if the LHC produced a quantum-scale singularity during a collision event, it would not be the world eating threat that uninformed doomsayers love to rant about. It would evaporate far too quickly to grow larger.) And what part of the predicted mass range do most of them fall into? Is there any evidence that the gravitational influence of dark matter has gotten measurably weaker since the time when these would have formed? Or would the smaller ones have been more likely to have merged into larger ones by now? Does the evaporation of Primordial Black Holes possibly in some way account for any or all of the Dark Energy? While I get that Hawking Radiation is theorized to be caused by virtual particle pairs, and the ‘radiated’ particle is just as likely to pop back out of existence and into the local vacuum energy field, wouldn’t that still be a net energy increase? With enough of an increase in energy being dumped into Spacetime in this fashion, could it not cause expansion? Sorry, I know that’s a lot of questions. But your excellent post spurred my imagination.